From left to right: Judy Woodruff ,courtesy of Frank Carlson; Nick Schifrin, courtesy of David Solimini; Amna Nawaz, courtesy of Robin Oelkers. 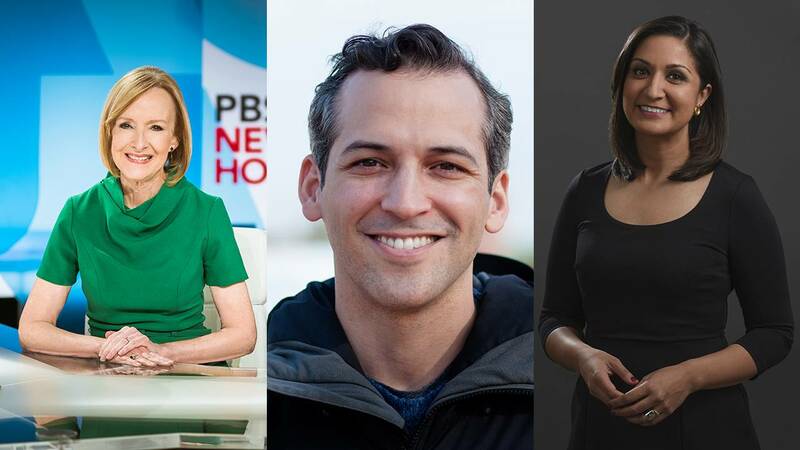 Washington, DC (3.22.18) – PBS NewsHour today names managing editor Judy Woodruff solo anchor of the nightly broadcast. Woodruff, who re-joined the NewsHour in 2007 as a senior correspondent, was named one of the NewsHour's rotating anchors in 2011, and in 2013, she and the late Gwen Ifill were named co-anchors and managing editors of the program, the first time in history two women were the co-anchor team for a national nightly news broadcast. With more than four decades of experience reporting at PBS, NBC and CNN, Woodruff has covered 12 presidential elections; interviewed 7 U.S. presidents; and is the recipient of the Poynter Medal for Lifetime Achievement in Journalism, the Edward R. Murrow Lifetime Achievement Award in Broadcast Journalism/Television, and The Arizona State University Walter Cronkite Award for Excellence in Journalism, among other honors. The announcement follows a months-long re-imagination of the NewsHour anchor desk, supported by an expanded bench of general and topical correspondents, including the new hires of Amna Nawaz and Nick Schifrin. Nawaz will substitute at the anchor desk and will cover a wide range of topics. Later this spring, following her April 2 start date, she will also launch a podcast and digital video version of NewsHour’s popular “5 Stories You Missed” series. Schifrin, who has spent the last two and a half years creating weeklong series for NewsHour from Russia, Eastern Europe, Kenya, Nigeria, and other countries as a special correspondent, will report from Washington, D.C. and overseas, as NewsHour’s new foreign affairs and defense correspondent, and will begin later this spring. In recent years and under the leadership of Woodruff and Just, PBS NewsHour has seen a significant increase in audience across platforms, including a 12% increase in its average nightly total audience in 2017 compared to 2016, at 1.9 million viewers. Online, NewsHour also saw significant gains, reaching 5.3 million average monthly website users (up 13%) and 1.6 million average monthly unique viewers on Apple News (up 532%) in 2017 compared to 2016. On YouTube in 2017, NewsHour had more than 136 million total views, up 43% compared to the year prior. And on social, average monthly engagement on Facebook was 1.2 million (up 28%) and on Twitter was more than 109,000 (up 111%). Woodruff re-joined the NewsHour in 2007 as a senior correspondent. In 2011, she was named one of the NewsHour's rotating anchors, and in 2013, she and the late Gwen Ifill were named co-anchors and managing editors of the program, the first time in history two women were the co-anchor team for a national nightly news broadcast. For 12 years, Woodruff served as anchor and senior correspondent for CNN, where she anchored the weekday program, Inside Politics. From 2006 - 13, she anchored a monthly program for Bloomberg Television, Conversations with Judy Woodruff. At PBS earlier in her career from 1983 - 93, she was the chief Washington correspondent for The MacNeil/Lehrer NewsHour. From 1984 - 90, she also anchored PBS’s award-winning weekly documentary series, Frontline with Judy Woodruff. At NBC News, Woodruff was White House correspondent from 1977 - 82. For one year after that, she served as NBC’s Today Show Chief Washington Correspondent. She is the author of This is Judy Woodruff at the White House. Woodruff is founding co-chair of the International Women's Media Foundation; serves on the boards of trustee of the Freedom Forum, The Duke Endowment, the Carnegie Corporation of New York; is a trustee emerita of the Urban Institute; and a member of Public Radio International's Board of Directors. She is the recent recipient of the Poynter Medal for Lifetime Achievement in Journalism, the Edward R. Murrow Lifetime Achievement Award in Broadcast Journalism/Television, The Arizona State University Walter Cronkite Award for Excellence in Journalism, the Al Neuharth/University of South Dakota Award for Excellence in Journalism, the Duke Distinguished Alumni Award and the Gaylord Prize for Excellence in Journalism and Mass Communications from the University of Oklahoma, among others. She is a graduate of Duke University, where she is a trustee emerita. Nawaz joined ABC News in 2015 where she anchored the network’s live and breaking news digital coverage, including on Inauguration Day 2017, Election Night 2016 and during the primary elections, caucuses, and presidential debates. She hosted the podcast and original video series "Uncomfortable.” In addition to reporting, writing and hosting a variety of video products, she reported a series in 2016 that tracked three, young voters in battleground states. Nawaz also spent a year tracking the lives of families in the small, Texas town with the highest percentage of Trump voters in the country in 2017, for an ABC News Features documentary called “Roberts County” and report for ABC News Nightline. Prior to joining ABC, Nawaz spent nearly 10 years at NBC News, reporting across the U.S. and from more than a dozen countries around the world. As the foreign correspondent/bureau chief for the network's Islamabad bureau, she reported from across South Asia and the region, with exclusive reports on U.S. drone strikes, and from previously-unvisited parts of the border region with Afghanistan. She also created and launched NBC’s Asian America vertical, in addition to filing packages for network shows, doing live reports for cable, and writing original pieces for digital. Nawaz has been honored with an Emmy award, multiple Emmy nominations, a Society for Feature Journalism award, and a prestigious International Reporting Project fellowship. She is a member of the Coalition for Women in Journalism, the Asian American Journalists Association, and the South Asian Journalists Association. She holds an undergraduate degree from the University of Pennsylvania, where she studied politics, philosophy, and economics, and received a master's degree from the London School of Economics, where she studied comparative politics. Schifrin has reported from more than 35 countries and will become the NewsHour’s foreign affairs and defense correspondent late this spring. For the last two years, he has been a PBS NewsHour special correspondent, creating weeklong series from Russia, Eastern Europe, Kenya, Nigeria, and other countries. Since last summer, he has reported on foreign affairs from Washington, D.C., with a focus on Russia, North Korea, and the Middle East. Prior to the NewsHour, Schifrin was Al Jazeera America's Middle East correspondent, based in Jerusalem, where he led the channel’s coverage of the 2014 war in Gaza. He won an Overseas Press Club award for his Gaza coverage and a National Headliners Award for his coverage of the 2014 Ukrainian revolution and Russian annexation of Crimea. Prior to Al Jazeera, Schifrin was a correspondent for ABC News, including the network’s Afghanistan/Pakistan correspondent from 2008 - 12. In 2011 he was one of the first journalists to arrive in Abbottabad, Pakistan after Osama bin Laden’s death and delivered one of the year’s biggest exclusives: the first video from inside bin Laden’s compound. His reporting helped ABC News win an Edward R. Murrow award for its bin Laden coverage. Schifrin is currently pursuing a master's degree from the Johns Hopkins School of Advanced International Studies (SAIS), concentrating in strategic studies. He is a visiting fellow at the Clinton School of Public Service, where he lectures and teaches a foreign policy class. He is also a Council on Foreign Relations term member and an Overseas Press Club Foundation board member. PBS NewsHour is seen by over four million weekly viewers and is also available online, via public radio in select markets, and via podcast. PBS NewsHour is a production of NewsHour Productions LLC, a wholly-owned non-profit subsidiary of WETA Washington, D.C., in association with WNET in New York. Major funding for PBS NewsHour is provided by the Corporation for Public Broadcasting, PBS and public television viewers. Major corporate funding is provided by BNSF, Consumer Cellular, and Entertainment Studios, with additional support from Alfred P. Sloan Foundation, Carnegie Corporation of New York, the J. Paul Getty Trust, the S.D. Bechtel, Jr. Foundation, the John D. and Catherine T. MacArthur Foundation, the Lemelson Foundation, National Science Foundation, the William and Flora Hewlett Foundation, Ford Foundation, Skoll Foundation, the Gordon and Betty Moore Foundation, Friends of the NewsHour and others. More information on PBS NewsHour is available at www.pbs.org/newshour. On social media, visit PBS NewsHour on Facebook or follow @NewsHour on Twitter.